With St. Patrick’s Day just around the corner, finding an Irish bar is a top priority. On March 17th, toast to Ireland’s patron saint with a pint or two at any of these five lucky picks. As Vancouver’s only Irish-owned bar, the Heather offers a truly authentic experience across the board. Serving traditional soda bread (baked in house) alongside pub classics and mixed beer drinks like the Shangy lager and lemonade, it’s an ideal spot to celebrate on March 17th. If you feel like something stronger, Shebeen Whiskey House is located just across the courtyard and serves 250 varieties of whiskey from all over the world. For a slice of the Emerald Isle on the Granville Strip, look for the red door belonging to Johnnie Fox’s. 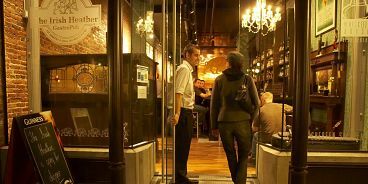 Inside you’ll find a traditional Irish pub, with a sizeable list of single malt and blended Irish whiskeys and scotches. It’s also one of the only bars in Vancouver to offer Magners Irish cider on tap. Food options include Yorkshire puddings and curry chips (an Irish snack of fries with curry sauce). Despite a prime location right at the corner of Denman and Davie, Shamrock Alley seems to fly under the radar. With a laidback vibe and a patio offering sweeping views of English Bay, it’s a good bet for brews or whiskeys. Open late every day, they also serve hearty Irish dishes with Guinness gravy. Dentry’s is a no frills neighbourhood haunt in Point Grey that takes its St. Paddy’s celebrations very seriously. This year, they will be rolling out the big guns with a live performance of the B.C. Regiment Irish Pipes at 8pm, followed by Irish dancers taking the stage at 8:30. If you’re in the mood for a nightcap, try one of their six different varieties of Irish coffee. Located on the waterfront in White Rock, Jimmy Flynn’s brings shamrocks and shenanigans to the suburbs. Serving up Irish classics, it has the feel of a cozy and casual pub. There is also a second location in South Surrey.